Republican Rep. Mick Mulvaney of South Carolina voted against the debt deal Wednesday night for a great many reasons, and one of those reasons is that he thought that the bipartisan legislation to reopen the government included funding for the Lord's Resistance Army, a Ugandan militant group led by exiled war criminal Joseph Kony. This is not true. But that didn't stop Mulvaney from including it in his statement denouncing the deal! 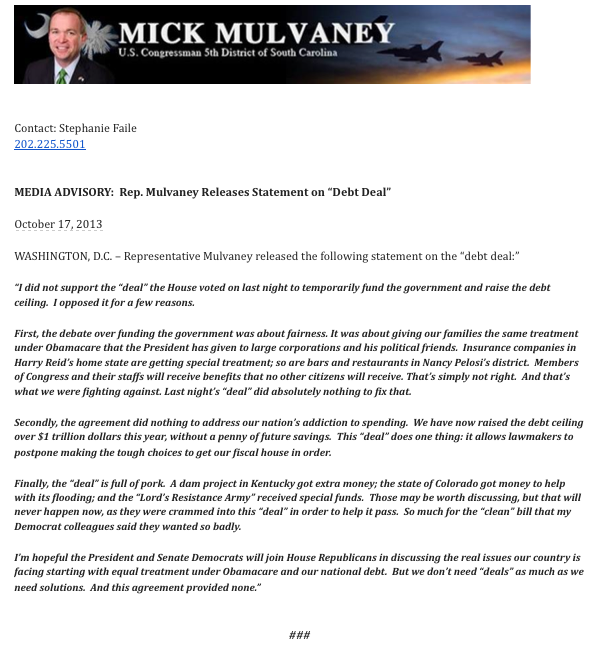 "Finally, the 'deal' is full of pork," Mulvaney said. "A dam project in Kentucky got extra money; the state of Colorado got money to help with its flooding; and the 'Lord's Resistance Army' received special funds. Those may be worth discussing, but that will never happen now, as they were crammed into this 'deal' in order to help it pass. So much for the 'clean' bill that my Democrat colleagues said they wanted so badly." As noted by the Huffington Post, the money in the deal will actually fund the Pentagon's efforts to support African forces currently conducting a manhunt for Kony.